Hello my friends! I just finished up another class for the Altenew Educator Certification program. This time the class was Clean & Simple Boutique cards. This one was jam packed full of great tips and ideas. I've been jotting notes while watching the videos and lets just say I took a lot of notes! It got my mind full of so many different ideas it was hard to pick just one to create for my submission. Here it is! The main theme of the class was to make a card simple yet stylish. There were lots of gorgeous examples in class. 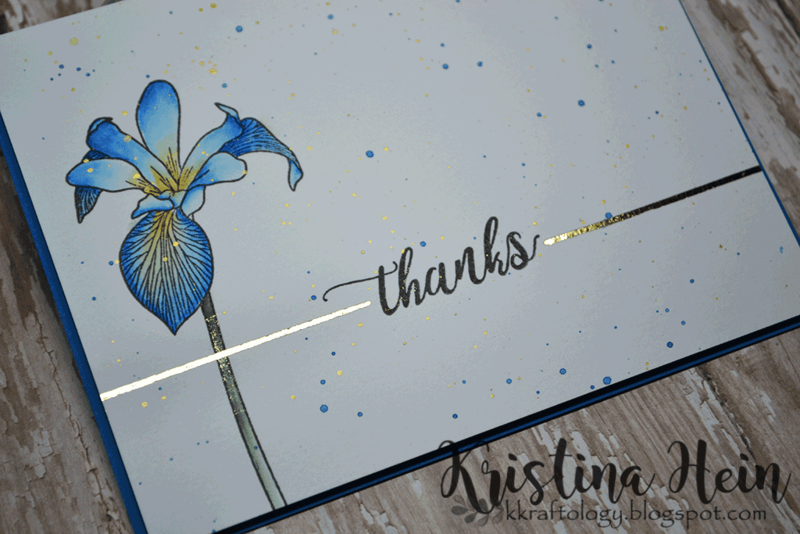 I learned how to add little extras that make your cards elegant while keeping them simple. They suggest adding foil and provide multiple ways to add it. I remembered I had a Minc toner ink marker just waiting to be used. This seemed like the perfect opportunity to break it out of the package! I started by cutting out a piece of Bristol smooth cardstock to 4 1/4" x 5 1/2". I used Bristol because I wanted to use my Zig Clean Color real brush markers. I would have used the Altenew watercolor brush markers but I don't have a set yet (on my Christmas wishlist!). The colors I used were Persian Blue, Ochre and Deep Green. I carefully applied color down where I wanted it to be darkest. Then I went back with a waterbrush and pulled the color out. I always keep a paper towel handy as well to dab off my brush if I want even lighter color. Next I stamped the Thanks sentiment with black ink that is also in the Enchanted Iris stamp set. Once everything seemed good and dry, I got out my Minc toner ink marker. I had never used it before so I didn't know what to expect. It worked like a charm! I used my T ruler to make sure I would have a straight line and drew it in with the marker. It only took a minute or so to dry. During that time I started up my Minc to preheat. I then cut a strip of gold foil just big enough to cover the line I drew. I put everything in place in the folder and ran it through the Minc. It worked awesome! At this point I had to hold myself back from adding sequins and such. The idea WAS to keep it simple. I added some splatters of the blue ink by scribbling my marker on a block and adding water. Then I dipped a paint brush in it and splattered away. I also did splatters with gold paint to help tie in the gold foil line. I trimmed off an 1/8th of an inch from 2 sides so it would be slightly smaller than A2 size. I had the perfect blue cardstock to make a cardbase. It really makes the flower pop! I did add craft foam behind the flower panel before adhereing it to the blue base. This class was really enjoyable and can't wait to get started on the next one! Thanks for dropping by! Thanksgiving is almost here! Yikes. I can hardly believe it. That means Christmas is going to sneak up on me so fast! Deep breath. I wanted to squeeze in one more fall card before it becomes all Christmas all the time. Seeing how tomorrow is Thanksgiving, I figured a Thanksgiving themed card was in order. Ears, Nose & Cheeks: R00. The ears also have a little bit of E81 to tone down the pink. Once I was all done with coloring I used my Scan n Cut to cut him out with a little border. I went back to the plaid paper. This is from Carta Bella's Fall Blessings paper pad. I pulled out two other patterns that went well with the plaid. An orange and a green. I really wanted a non standard die shape for my layers so I went digging through my stash. 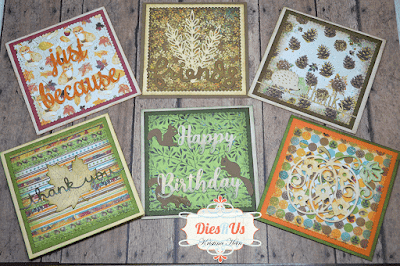 I found these beautiful Label 55 dies from Spellbinders. I cut the green and the orange papers with different sizes of the same die set. Then I cut the plaid paper with a scalloped rectangle die from Mama Elephant. I sponged the edges of the plaid paper with a mossy green. I decided to cut my label dies so that they would be flat on the bottom and line up with the stitched edge of the plaid paper. I sponged the edges of the orange paper but left the green one alone. I glued the mouse directly onto the green paper and glued the rest of the layers together. These were then glued onto a Neenah natural white card base. I stamped the Happy Thanksgiving sentiment onto another piece of the Neenah paper with the same mossy green ink I used to sponge the plaid paper edges. I cut it down to a small rectangle and sponged those edges with the orange ink. I used a piece of foam tape on the back to pop it up from the card. I thought it needed just a little something more. I didn't quite like the look of sequins but I did find these gorgeous gold gems from Pretty Pink Posh in my stash. Just perfect. And that's it! I hope you like my little mouse card and that you have a wonderful Thanksgiving. Happy Sunday everyone! 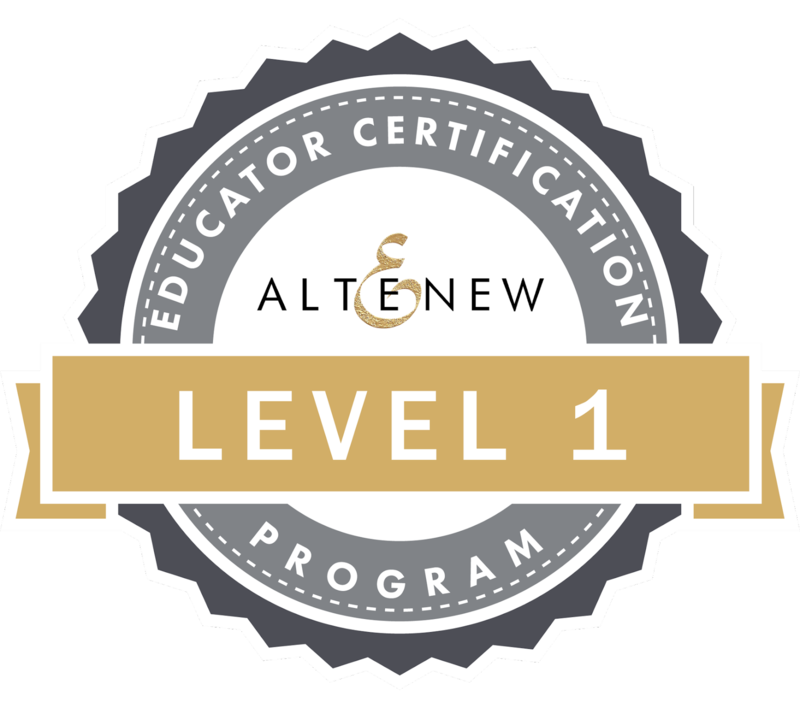 Recently I received word that I had been accepted into the Altenew Educator Certification program. I am so very JAZZED! I have to say that I love all things Altenew and I am looking forward to learning lots of new things. 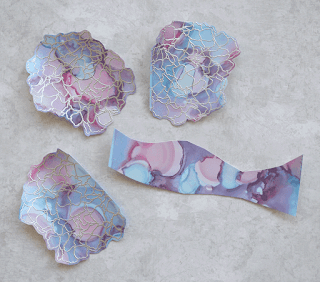 I find things that challenge me also make me a better crafter! The very first class is called All About Layering 1. 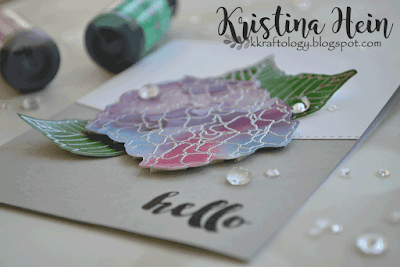 As you can guess, it's sort of a beginning guide for using their layering stamps. I did learn some trips and tricks during this class to line up the stamps better! For each class we need to create a project at the end for submission and a little bit about what we learned during the course of the class. Let me share my photo first. The set that I used is called Totally Tropical and I think this is the first time I have actually inked it up. I'm not sure why I waited so long! I think the thing that jumped out at me most was the idea of layering your stamped images in three different levels. Sure, I am used to doing two layers but for some reason I don't think of doing three. Basically you stamp directly on the paper, stamp on another paper, cut it out and glue directly to the base paper and the third layer is popped up on foam tape. Pretty darn cool! For this card, the majority of images were stamped directly on the card base. 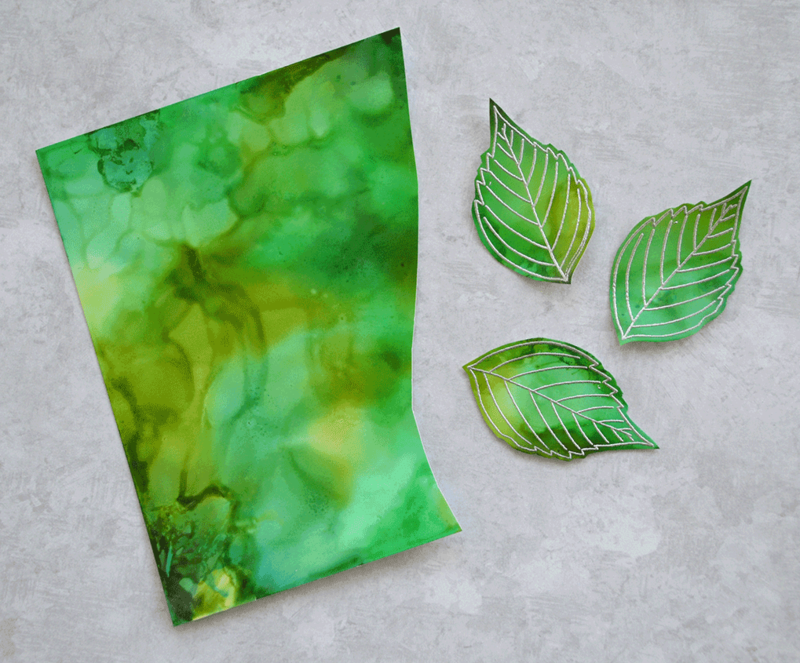 The top leaf was colored on another piece of paper, cut out by hand and glued onto the base. The top orange flower is popped up on foam tape. For the leaves I used Aqualicious and Teal Cave inks. For the popped up orange flower I used Autumn Blaze and Firebrick inks. 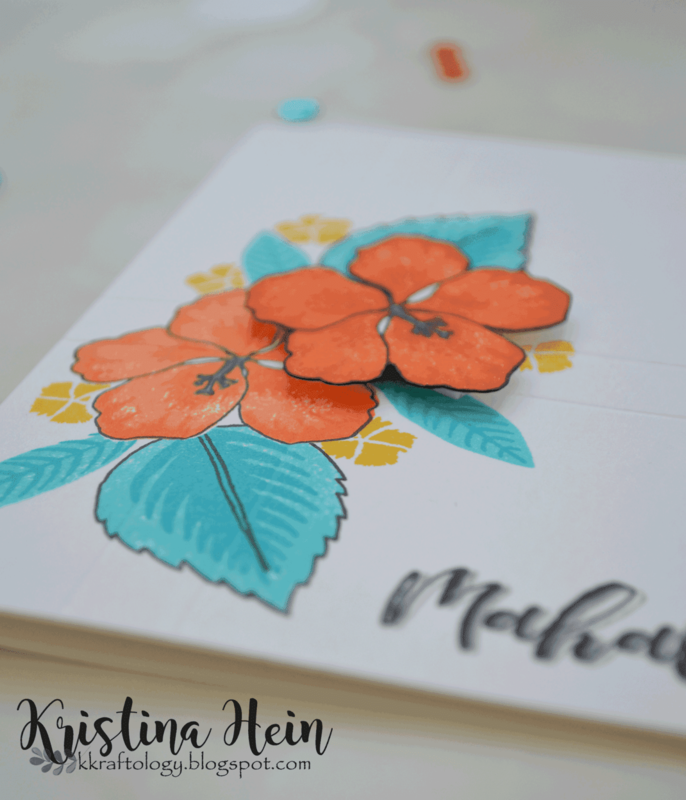 For the direct stamped orange flower I used Orange Cream and Autumn Blaze. The little yellow flowers were stamped in Honey Drizzle. I think it is hard to see in the photo but I did add some extra details. I used a Nuvo Aqua Shimmer Glitter Gloss pen on the top teal leaf and and over the darker orange areas on the popped up flower. Before I adhered the two layered pieces, I used my Score Buddy to add two horizontal embossed lines and two vertical embossed lines. They were both spaced a 1/2 inch apart. They intersect right about where the two flowers overlap in the middle. For the sentiment I first stamped it in black ink. Then I shifted it just a little and stamped it with a gray ink to give it a shadow. There you have it! I am definitely looking forward to starting the next class! Howdy and hello! I don't know about your neck of the woods but it has taken an abrupt turn to the cold here. Yikes! I'm really not ready for this at all. 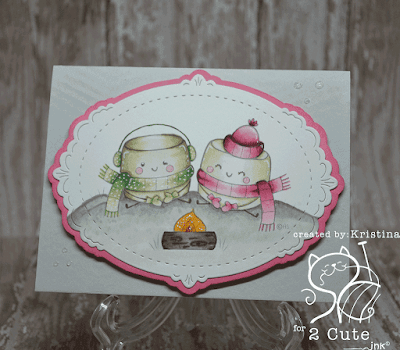 I am ready to create with adorable winter type images though. One of the newest digital stamps "Marshmallow Snowman" from 2 Cute Ink fits the bill. Can you handle the cuteness?!! I reduced the transparency of the digital stamp so it would be gray instead of black. I then printed it out onto watercolor using my laser printer. Then I picked out several distress inks to use as my watercolors. I ended up with Chipped Sapphire, Blueprint Sketch, Peacock Feathers and Tumbled Glass. I put clean water down first all around the snowman. I then used a palette to squish the pads against. I added water to give them a liquid consistency. I just started randomly adding the colors to the water already on the background. I let it sit overnight to dry. The next day I picked up where I left off. I mixed a little bit of Pumice stone with water and silver Finetec watercolor. Again I put down clean water first in the snow area. I used a brush to dab on the Pumice Stone mixture. I heat set it and then went back to add more layers until I was happy with the results. I heat set it again. Now I moved onto the snowman himself. I did all of the small areas first. Spun Sugar for his cheeks, a mix of Carved Pumpkin and Ripe Persimmon for his nose, Black soot for his hat and buttons and Wilted Violet for the scarf. I heat set everything. For the white areas of the snowman, I just kept watering down the black soot until it was pale enough. I concentrated the darker color near the edge and spread it out with water. After heat setting, I went back and added a few more layers to the scarf, the hat and the body until I got the dimension I was looking for. Heat set yet again. I wanted to have even more detail so I went over his stick arms with Black Soot. I used a black glaze pen on his buttons, his mouth and his eyes. Once the eyes were dry, I added little dots of white. 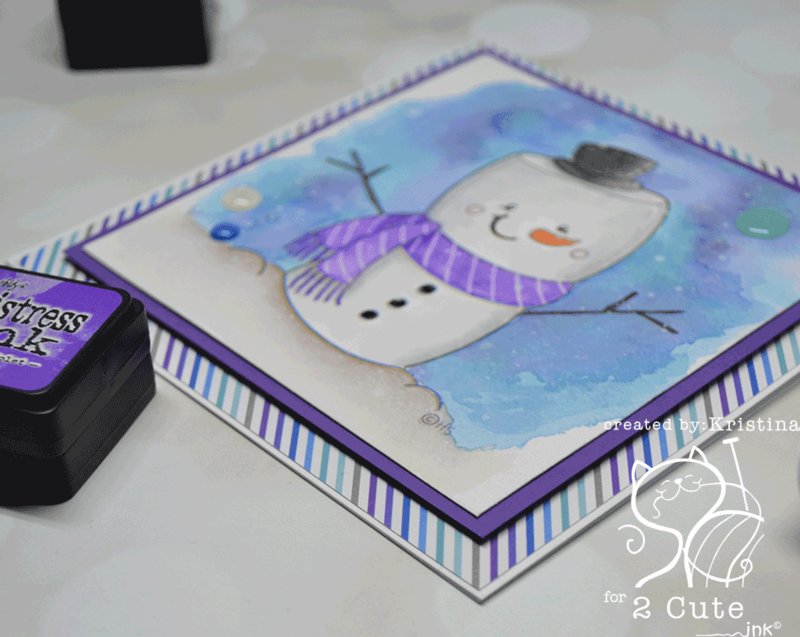 I then used the same white gel pen to add highlights to the nose, hat and the snowman body. I also added the striped detail to the scarf. 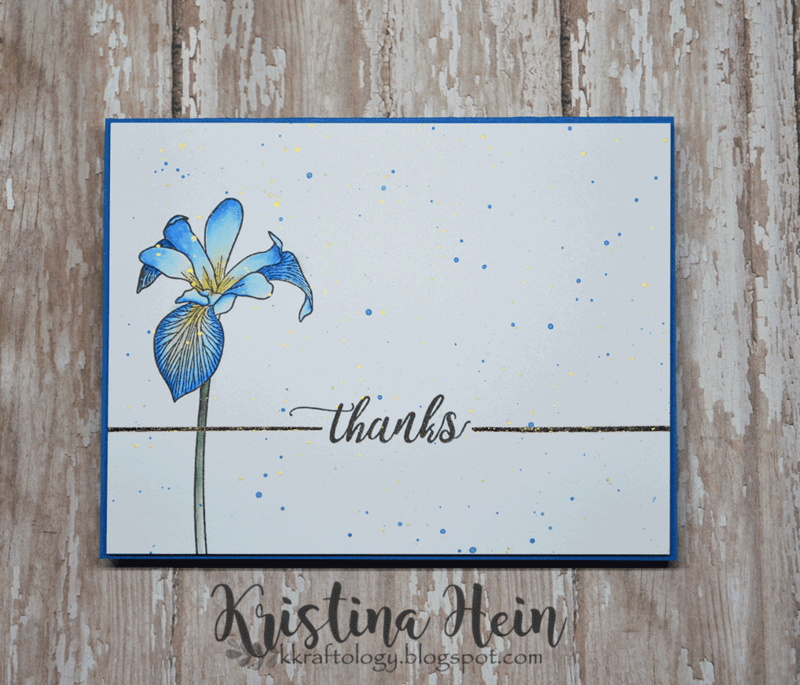 I mixed white paint with more of the silver finetec and lightly splattered the entire card front. Once the card front was dry, I cut it down to a 4 1/4" square. I glued it onto a 4 1/2" purple layer. I applied a generous amount of foam tape to the back of the purple paper. My white card base is a 5 1/8" square. To the base I glued the striped piece of Doodlebug patterned paper. The striped paper is cut into 5" square. I then put all of the layers together. For the finishing touches I added a couple Doodlebug Sprinkles and a few drops of Crystal Stickles. 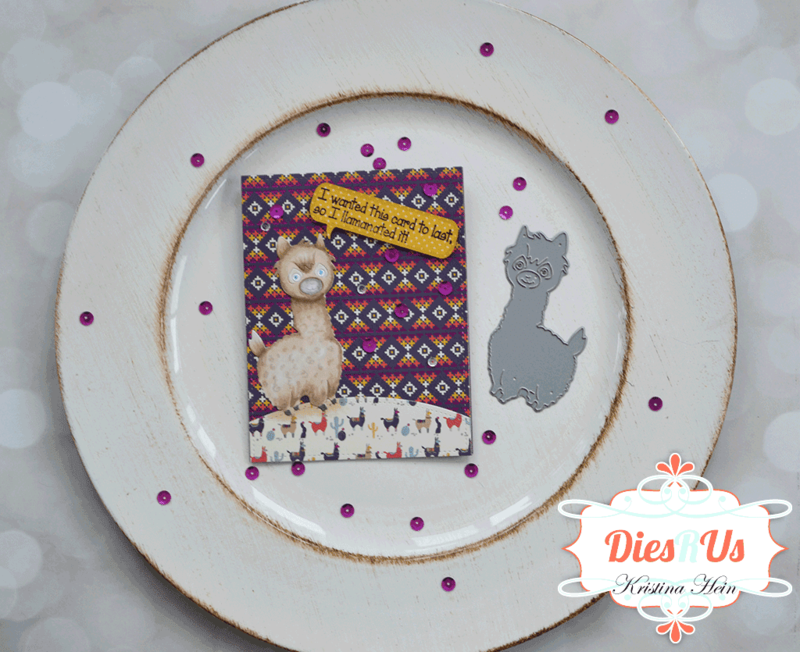 Now, hurry over right HERE and pick up this adorable digital stamp for yourself! I'm trying to participate in Kathy Racoosin's 30 day coloring challenge as I can. These cuties were the result! I lightened the digital stamp before printing it out onto Cryogen White cardstock. The entire image was colored with Copic markers. I did add some eyelashes with a very fine point black marker to the girl marshmallow. I cut the whole image out using a die from Papertrey Ink. I cut a larger layer using a rose pink cardstock and glued the two layers together. For the card base I used a very pale gray piece of cardstock. I felt it needed a little bit more. I used a stencil, a pale gray ink and a stencil brush to create a little bit of texture on the base. You can see it if you look closely in the photo. I like the way it adds to the overall design. Before gluing the marshmallows onto the base, I popped it up using foam tape. For a little more bling, I added dots of White Blizzard Nuvo glitter drops. I also added Stardust Stickles to the fire to give it some sparkle. That's it! I opted not to put a sentiment on the outside so I can use it for whatever I need later! Now, you need to head HERE to get your hands on the Toasty Marshmallow digital stamp. 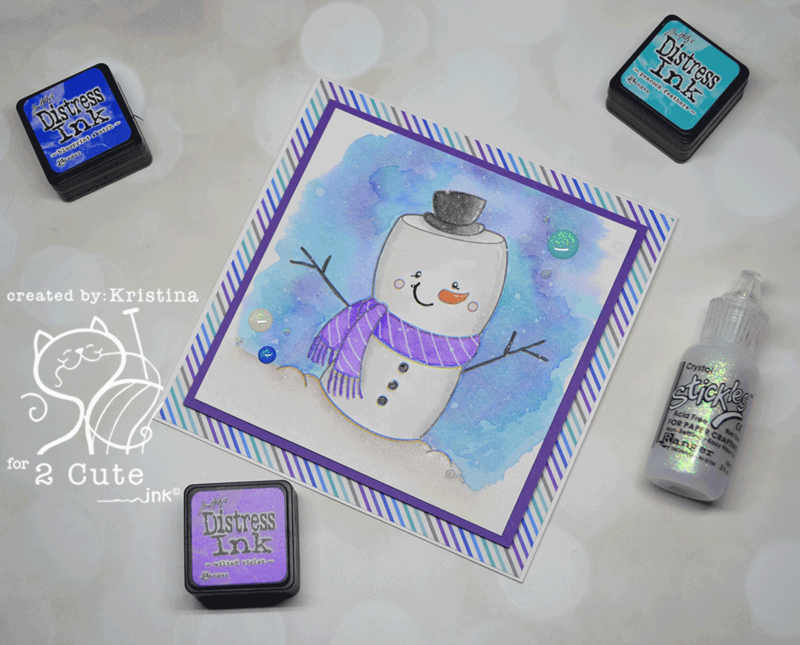 While you are there be sure to check out the entire selection of 2 Cute Ink stamps. 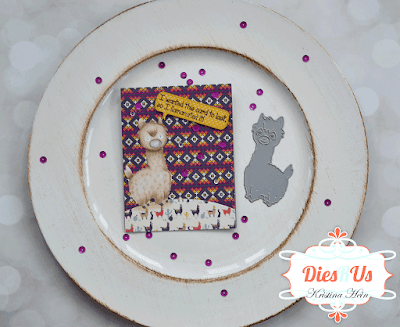 Heidi has over 300 digital stamps to choose from! For even further cuteness, come join her group on Facebook. 2 Cute Ink Digital Stamp Fans. I'll be back real soon. Like fall themed cards?? 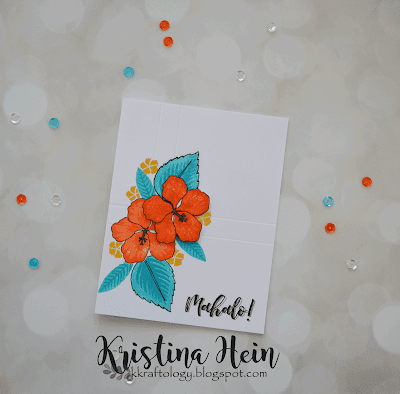 Head on over to the Dies R Us blog HERE where you can find complete details and tons of pics for the set of cards I created below. I just couldn't stop making cards! There's even a video!